High Speed Duplication Made Easy! 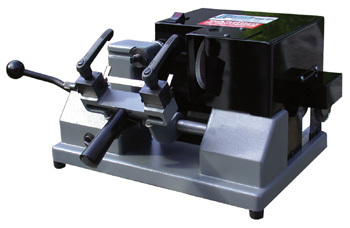 Distinctive Features of the Express Semi-Automatic Include: *	Quick & accurate duplication of almost any cylinder key effortlessly *	Built-in tip stops for shoulderless keys eliminates the need for key stops *	Tip stops reverse for I/C type keys with notches at the tip *	Rod wipers are included in each casting; during cutting, these wipers keep shavings out of the guide rod & housing *	All aluminum castings, hardened steel guide, AND a CPM M-3 type 2 cutter ensure longevity & ruggedness *	Sealed bearings used throughout the machine *	Can accommodate keys up the 4 3/8" in length *	Depths adjustments in .001" increments *	3 1/4" of clearance between cutter & vises for ease of key loading & unloading *	Wire brush included *	Approximately 10 seconds to duplicate a six pin key The Express carries Framon�s one-year, parts, labor and freight warranty. Machines are normally drop shipped from the factory, so shipping charges may be higher.